Article originally published at https://www.army.mil/article/210297. Germany. Grafenwoehr Training Area. September 2, 1960. Around 0900 hrs. Cloudy, as usual. A platoon of U.S. Army Soldiers are pitching a tent. Some are even on each other’s shoulders (Soldiers don’t lug around ladders). “It was a morning after pay-day in the summer of 1960. Our brigade had gone to Grafenwöhr for field training. The troops were to be billeted in over six hundred general-purpose tents. Our company had not yet arrived in force, but a sister unit, the 12th Cavalry, had come in the night before. Its tents were full of troops, still asleep at this early hour. I was returning from a bartering mission with another company’s exec, bringing rations I had traded for back to our mess hall. My ears pricked up at an odd, whistling sound overhead. In about a nanosecond, I realized it was an artillery shell that had strayed wildly out of the impact area. I stopped, frozen, and actually saw the 8-inch round come in. It struck a tent pole in the 12th Cavalry’s sector, detonating in an air burst. The roar was deafening, followed by a terrifying silence. […] I had seen a hundred war movies, but nothing had prepared me for the sights I saw that day.” — Colin Powell: My American Journey, 1995, p. 49 — 50. What Colin Powell, American statesman and retired four-star general, recounts here in his autobiography from his time as a platoon leader in West Germany, is the most serious accident in the history of the Grafenwoehr Training Area. On September 2, 1960, an artillery shell that was fired during a training exercise of the 3rd Armored Division missed its target area and impacted in Camp Kasserine where Soldiers of the Division’s 3rd Reconnaissance Squadron, 12th Cavalry, were accommodated. Sixteen Soldiers died and 27 suffered injuries, making it the accident with the most victims that the Grafenwoehr Training Area has seen to this day. In 1960, the story made the front page of the New York Times, but almost six decades later it is unknown to most people. Many who were witnesses of that day in 1960 are long gone from Grafenwoehr and evidence is scarce after so many years. One of the few at what is today U.S. Army Garrison Bavaria who can recount what happened is John Romweber, a teacher at Vilseck High School. His father, Pfc. George Peter Romweber, witnessed the event. “I did speak to my dad about it when he was older and he told me about it,” said John Romweber. George Peter Romweber, born in 1940, had volunteered for the Army and was with the 12th Cavalry, 3rd Armored Division as a tank driver. “I remember his Army shirt had a little spear patch, the spearhead,” John Romweber said. In September 1960, Pfc. Romweber was 19 years old. “My dad arrived that morning. And an hour later he was in this accident. So he was only in Graf for about one hour,” John Romweber said. The Soldiers of the 3rd Division’s Reconnaissance Squadron had indeed just arrived in Grafenwoehr when the accident happened after morning roll-call. Pfc. Romweber was in one of the tents with another Soldier on his shoulders. “It was raining I believe, and they were attempting to reach and lower a rain flap such that the rain would not enter the tent,” John Romweber said. According to the New York Times, thirteen of the 18 Soldiers in the second tent were killed instantly when the shell struck. A total of 15 Soldiers died on the day of the accident and 28 were injured. A 16th Soldier died of his injuries one day after the accident. Pfc. Romweber belonged to those who were wounded but survived. “When I was a kid, I recall hearing that my father was the only one in his tent to survive the blast, regaining consciousness among severed arms and legs and not knowing if they belonged to him,” John Romweber said. Pfc. Romweber and the other wounded were flown to Army hospitals by helicopter. John Romweber’s father was first taken to Nuremberg and then to Frankfurt hospital and ultimately to the Walter Reed Medical Center in the United States. Pfc. Romweber’s recovery took 18 months. By the time he was healthy, his time in the Army was over. “He was obviously very lucky to survive,” said his son. For those whose lives were lost, a memorial service was held in Grafenwoehr two days after the accident near the very scene where it had happened. “Soldiers of the Third Armored Division assembled in a hollow — with sixteen gaps in the ranks — before an altar between two fir trees. 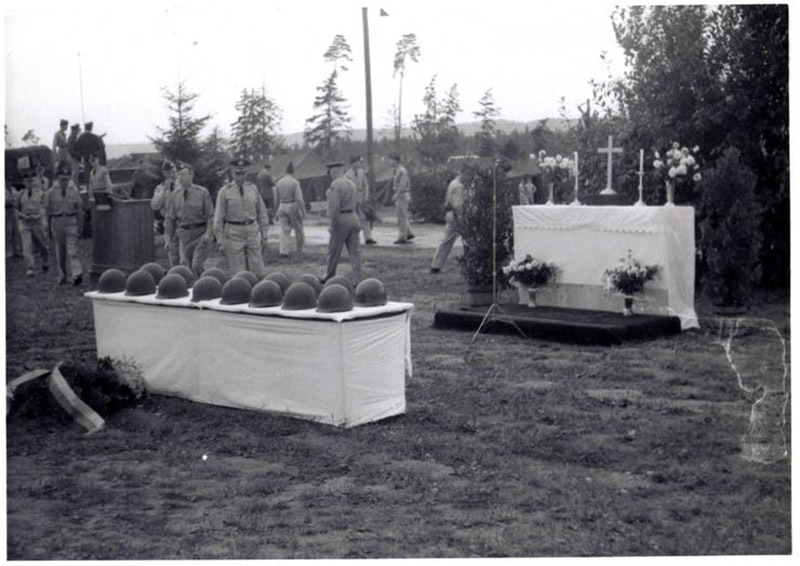 Sixteen steel helmets on tables near the altar bore testimony to the accident […],” reads the report from the New York Times. The artillery shell was found to be overcharged and badly aimed. Human error had caused the accident that cost these young men their lives. Back then the New York Times wrote that the accident is believed to have been the worst affecting U.S. troops in West Germany. “I have read it was the biggest loss of life almost to the end of the Cold War,” said John Romweber. Despite this, there is not much that reminds people of what happened at the present day except two sentences about the accident in the Grafenwoehr Culture and Military Museum. John Romweber moved to Bavaria in 2010, the year of the 50th anniversary of the accident. According to John Romweber, his father did not speak of the accident often throughout his life but his son emphasized that he lived the remaining 57 years of his life in a state of joy. BECKWORTH, Specialist 4th Class James B.
MAPPIN, Sgt. 1st Class Jack W.
MERRILL, Specialist 4th Class William A.
EDITOR’S NOTE: Story researched and written by German intern Johanna Pschierer. Information detailing this incident is scarce. The only recorded history of the event courtesy of New York Times and second-hand accounts. If you have photos, and would like to share with the U.S. Army, please scan and email to the U.S. Army Garrison Bavaria Public Affairs Office at usarmy.bavaria.id-europe.mbx.pao@mail.mil. We’ll credit you and post for historical purposes in our photo archive at www.flickr.com/photos/usagbavaria/albums/72157694719964480. Our goal at the PAO shop is to document this tragic event. Never forget!